Creating Engaging Activities & Events: Events are one of the major drivers of visitors to wineries and to wine country. Expert Beth Costa from Wine Road will be presenting to attendees about creating interesting themes, executing effective planning, ensuring financial success, and what works and more importantly what does NOT work when designing wine country events. Beth Costa is the Executive Director of Wine Road, an association of 197 wineries and 54 lodgings in the Alexander, Dry Creek, and Russian River Valleys of Northern Sonoma County. Wine Road is famous for its many events, including three large annual celebrations including many of the area winery. Beth previously worked for Kendall-Jackson Wine Estates as the Tasting Room manager of multiple properties. 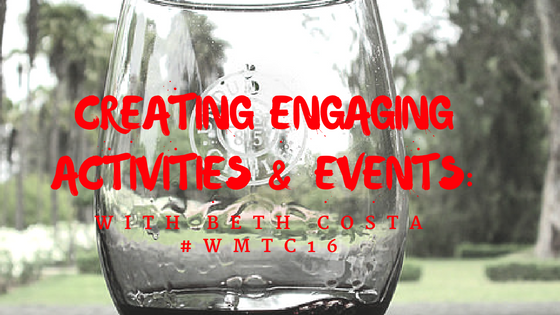 WMTC asked Beth Costa to tell us a little more about herself and her presentation details to give some insight. “I have been living and learning how to manage large industry wide and winery events for the past 16 years. My, how times have changed! Sixteen years ago it was work to simply get the word out that you were hosting an event. Printing stacks of postcards, collecting mailing addresses, lots of busy work. We no longer see a need to print and mail postcards; it’s easy to get the word out. Now the issue is how to price an event so the right amount of people attend and buy wine. You need to create an event where the attendees make connections with the winery or wineries so they want to come back and support those wineries in the future. I imagine every speaker at the Wine Marketing & Tourism Conference will touch upon on how today’s consumer wants an “experience” not just another belly-up-to-the-bar tasting. This is true for every winery event. As an association representing 200 wineries the challenge for us is creating experiences that work for so many players. In Sonoma County, California we are also in the midst of a heated debate between residents, wineries and the county planning department. Issues on the table are how many events are too many, along with how to better manage the flow and the concentration in rural areas. If this debate is not currently happening in your neck of the woods…believe me, it will. In this session I will share what we have learned during this wild and crazy year of celebrating our 40th Anniversary of Wine Road, with a different event every month. What were we thinking??!? Interested in improving your event planning and execution? Register for WMTC here.